This morning's satellite picture (below) shows a large low pressure area to our west. 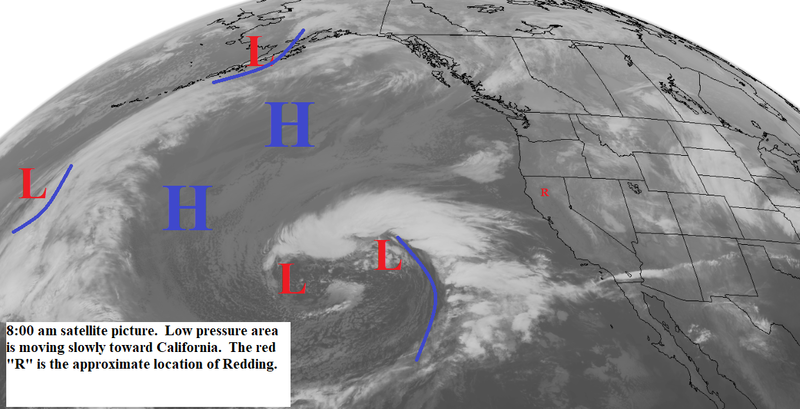 This system is moving slowly eastward and will move across Northern California Tuesday and Wednesday. A colder low pressure trough will drop southward from the Gulf of Alaska and be along the coast Thursday afternoon and Friday (see map below) and will move across the north state Saturday. Clouds will increase tonight with rain Tuesday through Wednesday evening. Wednesday night and part of Thursday we will have scattered showers and then more rain Thursday night and Friday with showers on Saturday. The first storm is warm so snow levels will start out at 5000 feet and rise to above 6000 feet. The second storm is cold so snow levels will start dropping Thursday and be down to around 3000 feet by Thursday afternoon and Friday. Late Sunday and Monday a frontal system will brush the north state with showers mainly over the higher elevations.